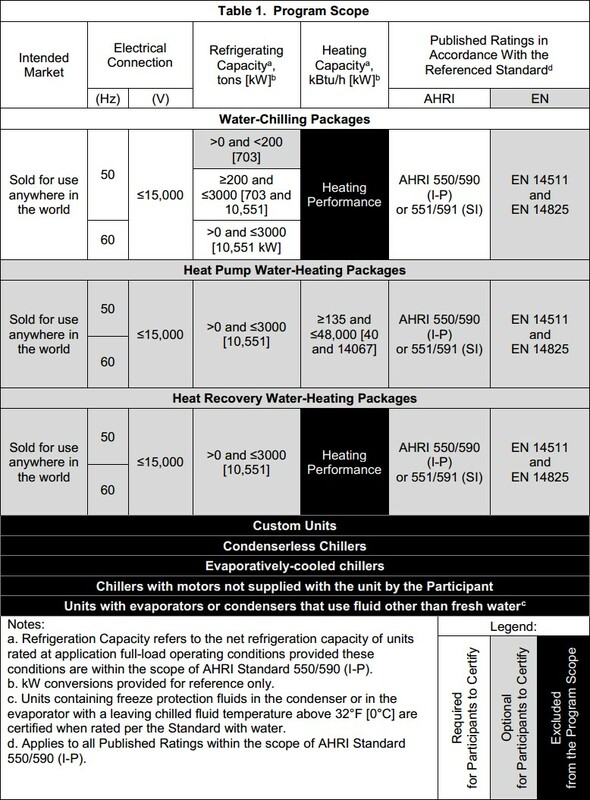 Find AHRI Certified® Water-Cooled Water-Chilling and Heat Pump Water-Heating Packages Using the Vapor Compression Cycle. Specification Sheet Verification Complete this form for each WCCL specification sheet verification request and submit by also completing this online form. A copy of the output report from the manufacturer’s Selection Rating Software must be submitted in conjunction with this form. All fields must be completed prior to submission. Note that AHRI only verifies the Certified Data shown on each output report. Water-Cooled Water Chilling and Heat Pump Water-Heating Packages. A factory-made and prefabricated assembly (not necessarily shipped as one package) of one (1) or more compressors, condensers and evaporators, with interconnections and accessories including controls, designed for the purpose of cooling or heating water. It is a machine specifically designed to make use of a vapor compression refrigeration cycle to transfer heat from a cold water fluid circulating system to a warm water fluid circulating system. This Program tests and certifies Water-Cooled Water-Chilling and Heat Pump Water-Heating Packages Ratings as defined in this Section. Non-Standard Part-load Value (NPLV.IP or NPLV.SI). Units that are not able to operate at Standard Rating Conditions shall be tested at the unit design conditions and NPLV.IP or NPLV.SI conditions. Non-Standard Part-load Value (NPLV.IP and NPLV.SI). Tested Heating Ratings. AHRI tests published ratings to AHRI Standards 550/590 (I-P) and 551/591 (SI). Standard Rating Conditions: Each AHRI selected test sample shall be tested at one (1) of the Standard Rating Conditions defined in Table 1 of the Standard. Selection of Tested Condition: AHRI shall select one (1) Standard Rating Condition from those listed in Table 1 of the Standard for verification. This selected rating condition must be one in which the Participant’s Primary Catalog / Selection Rating Application claims as AHRI Certified for the particular unit being tested. Certified Heating Ratings. AHRI certifies published ratings to AHRI Standards 550/590 (I-P) and 551/591 (SI). Evaporator and condenser water pressure drop. Tested Cooling and Heating Ratings. Published ratings of units selected for testing that AHRI Certifies in both Water-Chilling and Heat Pump Water-Heating modes shall be verified as specified in the above Tested Cooling Ratings and Tested Heating Ratings sections during the same scheduled test.